click on name to the left. 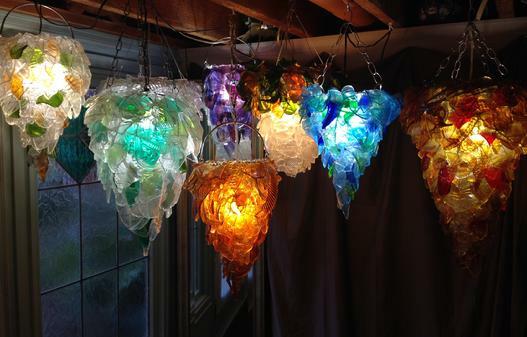 Seattle's Upcycle Artist Russ Morgan has been working with recycled materials and thinking GREEN for over 25 years. He's currently making chandeliers, lamps, and wall sconces incorporating vintage cups, vases and other thrift store finds. 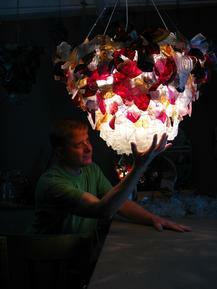 He also breaks and tumbles colorful patterned glass for a beach glass effect that he hand wires and assembles. Customized chandeliers can be made as well. They are currently available at his gallery art studio in West Seattle at 5323 SW Dakota St. Seattle Wa. 98116. Call Russ at 206-915-2128 or email at him at morganruss@hotmail.com to schedule a visit. Russ was recently featured at the Hotel Monaco in downtown Seattle for Earth Day. See pictures below from the show. Russ Morgan teamed up with Ginny Ruffner and Vincent Lipe on June 28th, 2013 for the fundraiser "Set the Table" at the Seattle Art Museum Sculpture Garden. 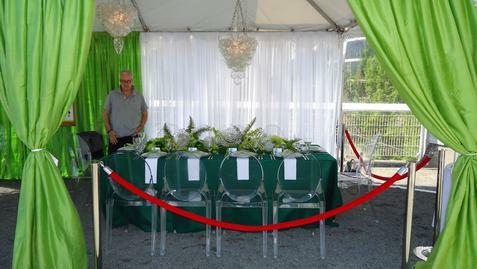 They created the VIP table for Jon and Mary Shirley. Russ provided the chandeliers.